Hawaiian Islands: East vs. West side. All the Hawaiian islands are “volcano” islands. This means they have large mountains (old volcanoes) in the center with an East side and a West side. The winds come from East to West. On the East, the rains are frequent and the lands are green and tropical. On the West side the land is dry. Because of ocean currents, beaches are frequent on the West sides but rarely exist on the East side. Because most tourists enjoy always dry weather with sandy beaches the resorts on all the Islands are on the West side. Oahu has Waikiki, Maui has Kaanapali and Weilea and the Big Island has Kona. Even the two resorts on little Lanai are on the West side. This leaves the West side of each Island heavily commercial. Large resorts offer large golf courses and trendy restaurants. The weather is hot and dry, unlike the beautiful pictures of waterfalls and orchids. Towns on the East side don’t exist at all, or offer nothing to see for an interested tourist. The exception is Maui’s Hana Highway, which is beautiful for a day trip. 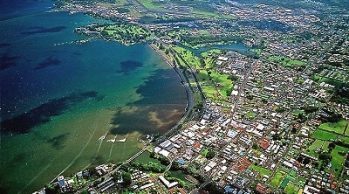 For the above reasons, the town of Hilo, on the East side of the Big Island, is not as popular as Kona, the major town on the West side. 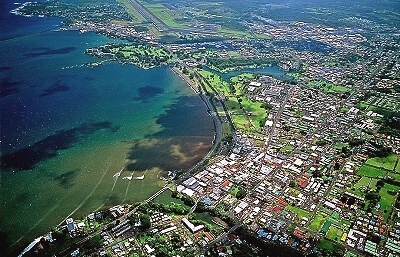 Few people realize that Hilo is the State’s second largest city! Yes, larger than Kona or Maui’s Lahaina. As will become clear by reading our sites “30 Best Travel Destination around Hilo” there is more to do and see in Hilo than any location on any Hawaiian island! If you want to sit on a hot beach, go to Florida. If you want to explore Hawaii, Hilo and East Big Island waits for you. Kona vs. Hilo. The Big Island is the only island with thriving towns on both sides of the island. Kona is on the West side and Hilo is directly across on the East side. Unfortunately, for all the reasons mentioned above, most people spend their vacation in Kona and only travel through Hilo for a brief stay. Want to stay at a huge resort and swim with dolphins? The Hilton at Waikoloa Village should be your pick. This is also an activity offered in Florida. Look through a tour guide of Kona and West Big Island, and you will find there is very little to do. The resorts on the Big Island don’t even offer sandy beaches. Oddly enough, you need to search them out with a car. Most tourists visit Hilo and the East side to visit Hawaii’s only active volcano, Kilauea. People often come for that reason and pass over the less obvious destinations. Do you want to drive just a few minutes in Hilo and swim at a waterfall? Visit Rainbow Fall and Boiling Pots. Do you want to enjoy a black sand beach and the best snorkeling you will likely ever experience, visit Richardson’s Beach Park just 3.5 miles from downtown Hilo. You will likely not find a dolphin there, but chances are you will swim past a Green Sea Turtle. Did you go to Hawaii to enjoy tropical plants? The Hawaiian Botanical Gardens is just 10 minutes North of Hilo and is exceptional. Museums such as the Lyman and Tsunami museum are in Downtown Hilo. How about a horseback ride through a lush tropics and streams? Go North to Waipi’o Valley. Hilo does not have resorts. Be careful if booking a hotel. Read the reviews. Use our guide on this site. Don’t just stay a couple days and miss all the unique hidden gems Hilo and East Big Island has to offer. Plan your stay carefully and you will keep busy for a week and leave with memories of having explored the best of the Hawaiian Islands.